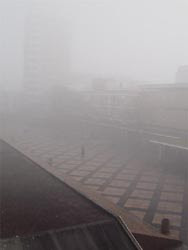 Alice In Poland: Darkness in the Morning, But Sunny Days Ahead! Darkness in the Morning, But Sunny Days Ahead! This Psalm came to me this morning as it has been the 3rd in which I have woken up to soupy fog and darkness. I am getting a taste of what winter will be like here. I am trying to put together a strategy to function in physical darkness for the next 5 months. Last night it got dark at about 4:30 and I am told that it gets even darker sooner. I am a Colorado girl used to about 325 days of sunshine and now, my first winter in Poland (I was in Colorado last winter) looks to be a new challenge to me. Even as the challenge "looms", I am confident in my Lord's provision and help. He will be by my side as I walk this unknown road of physical "darkness". This morning, I found it VERY difficult to get up just because of the game that the weather played with me. I honestly thought it was still 4 in the morning when it was 8. My light bill will be a little higher this winter as I combat the darkness. Now I wish I had gotten a daylight lamp! :) My desire is that God's Light will continue to shine through the darkness, even the physical darkness in which I am now encountering. Tomorrow I embark on a wonderful mini-vacation! My friend, Krista and I are going on a photography road trip to Germany!!!!!! 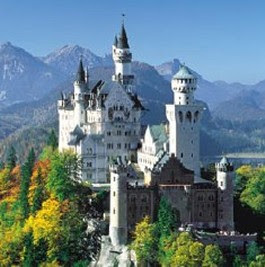 The destination is the fairytale castle of King Ludwig II, Neuschwanstein! We are going to try to hit 8 romantic era villages in 5 days and take as many pictures as possible! We are hoping to hit a Starbucks in Dresden! Awe Starbucks, what do you taste like? I forget! :) I will be posting picts when we get back. Mountains! Lovely mountains! I can not wait! The sky will not be blue, but there will be mountains!!! Yippee! I will be back around the 6th. Alice I had that same Psalm in my head this morning. Cheer up - you should see the entire Carlson household trying to get out of bed each morning. It's difficult for us too (and I'm the bad guy that reminds everyone to get moving every 3 minutes). Be glad you don't have to hear me fussing at you every 3 minutes each morning. In light of your upcoming Starbucks tour, I'm off to make myself a coffee. Ooooo... I'm so jealous! Have fun!!! You will have so much fun. And you'll love Neuschwanstein! Try to take the carriage ride to the castle. It's very fun. I can't wait to see your photos.